For a general list of flags, see Lists of flags. Flags of the World (abbreviated FOTW or FotW) is an Internet-based vexillological association and resource. Its principal project is the Internet's largest website devoted to vexillology, containing comprehensive information about all kinds of flags, and an associated mailing list. The mailing list began as a discussion group in about September 1993, while the website was founded by Giuseppe Bottasini in late 1994, and Rob Raeside took over as director in 1998. Flags of the World became the 56th member of the FIAV in 2001. Flags of the World describes itself as "...an Internet group, the sole purpose of which is the advancement of the pursuit of vexillology, that is the creation and development of a body of knowledge about flags and flag usage of all types". Both the website and the mailing list operate in the English language, though there are members from around the world and as such information from many languages is translated and included. The mailing list is monitored by the FOTW Listmaster, while work on the website is coordinated by the FOTW Editorial Director. An editorial staff of 21 unpaid volunteers manages and edits the FOTW website, which (as of 2013) contains more than 53,000 pages about flags and more than 102,000 images of flags, and also includes an extensive online dictionary of vexillology. The website is updated once a week with fresh material; some mirrors update monthly. Due to the high amount of material there is an editing backlog, causing some areas of FOTW to contain outdated information. There are also some mirrors that have not been updated for varying periods of time and which are therefore considered "historical". The source for material on the FOTW website are contributions to the FOTW mailing list, which has over 1,000 members, of which some 100 are active contributors. The mailing list has notable minorities of Portuguese, French, Dutch, and Russian speakers. A staff of three unpaid volunteers manages and moderates the list. An affiliated Flags of the World Facebook group has been established, inaugurated by Edward Mooney, Jr.
As of October 2018[update] the group is run and moderated by a team of ten administrators, and has over 12,000 members throughout the world. FOTW displays standardized flag images in GIF format, usually at a height of 216 pixels. 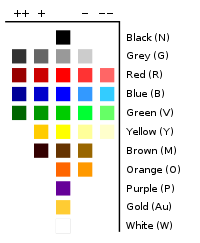 While the GIF file format is capable of displaying 256 colours, the site's standard calls for a more restricted "FOTW palette" of 32 colours. White on the hoist stands for peace, blue on the fly for progress. 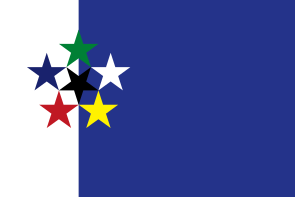 The six colours of the stars are the main colours used in flags. The stars help to make one bigger symbol. The way the stars are all connected to each other represents the Internet. The flag is thus used as a rare representation of the Internet on a flag. ^ a b c d e f "Current Members". Fédération Internationale des Associations Vexillologiques. 2016. Retrieved 5 June 2016. ^ "Flags of the World mailing list". Yahoo! Groups. Retrieved 9 December 2012. ^ "FOTW Editorial Staff". Flags of the World. Retrieved 5 June 2016. ^ "History of FOTW". Flags of the World. 2015. Retrieved 5 June 2016. ^ Flags of the World mailing list rules, Part 4, Article 1. ^ a b "FOTW Editorial Staff". Flags of the World. Retrieved 12 July 2009. ^ "Welcome to Flags of the World". Flags of the World. Retrieved 12 July 2009. ^ "FOTW mailing list". Yahoo! Groups. ^ "FOTW colour guide". Flags of the World. 2015. Retrieved 5 June 2016. ^ "FOTW Official Flag". Flags of the World. Retrieved 19 October 2007.